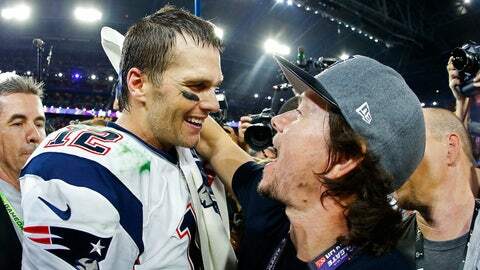 Mark Wahlberg was one of the first people to congratulate Tom Brady after the Patriots' 28-24 win in Super Bowl XLIX. Tom Brady loves his "Boston crew." Specifically, Brady was asked, "How do you support each other through the tough times?" After Brady gave his celebrity friends props, he joyfully added, "That is the Boston crew, man."